For us, Corporate and Social Responsibility (CSR) is more than just one of the ‘in’ things for companies to be concerned about. We strongly believe it is much more than just ticking the right boxes in a policy document; CSR is about getting down to doing something positive to protect and sustain the environment and contribute to society. At ESiT our policy was borne from the desire to formalise the good practice and attitudes already inherent in our staff and share them with our customers and our environment for the benefit of all. Our aims are to minimise the impact of our business on the environment, have a positive effect on society and seek to work with other organisations who embrace these objectives. We aim to use natural resources responsibly, work with community projects and encourage and educate our employees in these goals. What do we actually do as part of our CSR policy? We recycle all possible office materials (paper, plastic, printer cartridges), and use dedicated printers for reusing printed paper. Staff are encouraged and rewarded for being ‘green commuters’; each time a member of staff uses an environmentally friendly way of getting to work the company donates £1 to one of two charities. This year, local charities Loros and Groundwork Leicester and leicestershire (formerly Environ) receive the benefit of staff who car share, walk, cycle or use public transport to get to the office. 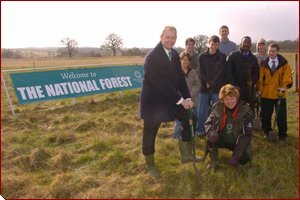 Loughborough is close to the National Forest and in 2004 and 2005 we have planted 100 trees in the nearby Forest to offset our carbon emissions for those years and will continue to work towards a carbon neutral status. Staff are given up to 3 days additional leave per year to get involved with voluntary work either locally or nationally. ESiT supports local charities through staff fundraising, sale of old equipment and corporate gifts. Travel is a necessity – we want to go and see our customers but are introducing strategies to cut down on unnecessary car use, improve fuel efficiency and look at CO2 emissions and fuel economy for all new cars. We hope others share our desire to promote these attitudes and are keen to hear your suggestions on how we can develop our policy further, or discuss with you how we have gone about implementing our policies.